All DeNovo watches are designed by Giacomo Soriani in his studio in Pesaro, Italy. Born in Pesaro in 1973, Giacomo Soriani is a designer, artist and goldsmith who passed most of his childhood cultivating his profound passion for drawing. At a very young age, he started working as an illustrator in some of the most prestigious publishing houses in the world, earning various important acknowledgements. Since the end of the 90″s, Soriani began working in the industrial design sector with a special attention towards watch design and jewelry in which he continues to work today. Today Soriani works in a wide range of disciplines, creating everything from: furniture, watches jewelry, glasses and fire arms and more, for clients worldwide. Soriani’s enjoys spending time in his country house, immersed in the heart of the Italian Apennines of the Marche region. There, in close contact with nature he experiments with new expressive forms, tapping into the core of his ideas. 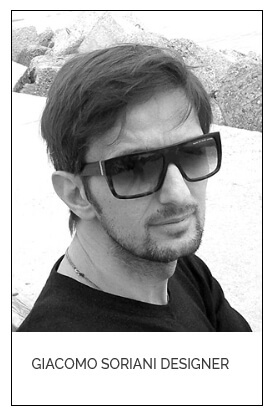 Soriani lives and works in Pesaro where he continues to develop his great passion for design. Your Time – Your Style! Our timepieces feature a very distinctive “DeNovo look”. Soriani’s art is not only creating a watch that is technically complicated, but also conforming the design to the practical limitations of a wrist watch. The result is a unique sporty watch that is extremely “soft” on the wrist, offering a comfortable and ergonomic experience. One of the main challenges when designing sport oriented watches is combining materials, colors and finishes. But that is not where the challenge ends. Though masculine in nature and boosting 46mm cases, Soriani manages to dress each DeNovo watch with soft lines, making it very appealing to the eye. Soriani’s Timepieces of art are a testimony to the renowned Italian design heritage.